New York, Perls Galleries, 30 Major Acquisitions, April-May, 1975, no. 7 (illustrated on the cover). Flint Institute of Arts, Alexander Calder: Mobiles, Stabiles, gouaches, Drawings from the Michigan Collections, February-March 1983, p. 16, no. 9 (illustrated in black and white). New York, Hammer Galleries, Modern Masters: Paris & Beyond, October 2011-January 2012, pp.9 and 17 (illustrated in color). New York, Hammer Galleries, Objects in Space: Léger, Miro, Calder, November 2012-January 2013, pp. 73 and 87 (illustrated in color). This work is registered in the archives of the Calder Foundation, New York, under application number A07732. Red, Blue & Black Cascade exemplifies the dynamic sense of movement and color that play a part in the artist's most memorable works. The graceful S curve composed of the brilliantly colored elements is carefully counter-balanced by each individual element. This graceful balancing act is evidence of Calder's exceptional talents not only as an artist, but also as an engineer, a talent which enabled him to harness the physical forces of his chosen medium with such spectacular and delightful effect. Added to his engineering skill is his bold use of color, which when combined with the sensation of movement, produces some of the most visually spectacular works of his generation. 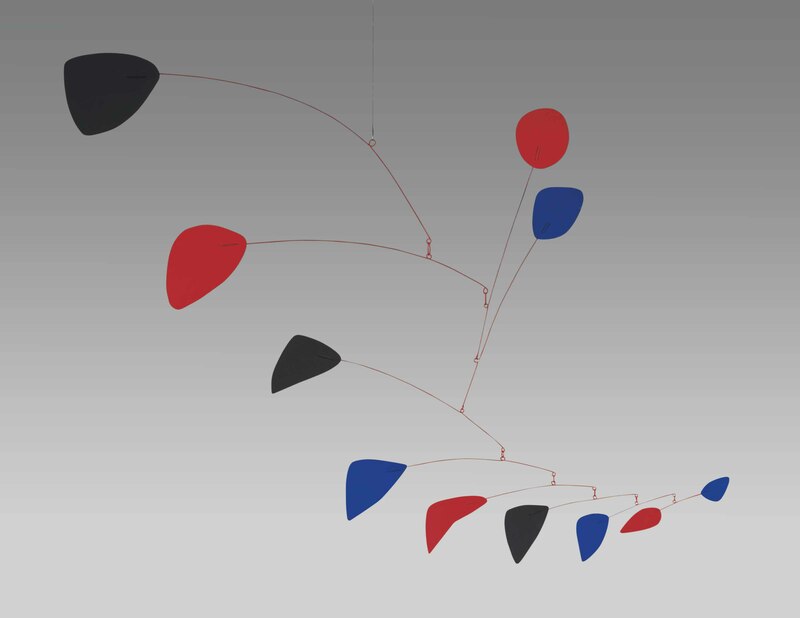 For Calder, color was not a representational force but rather an emotional one, in much the same way as the historical pioneers in non-traditional use of color such as Henri Matisse and Andre Derain. The color, shape, and line of Red, Blue & Black Cascade closely relate to the visual language of another modern master, Joan Mir©o. Calder and Mir©o were friends for much of their lives: they met in Paris in the 1920s and developed as artists alongside each other as peers. Both were interested in bringing elements of play and whimsicality into their art, and both sought to depict elements from nature in their work through the use of abstract forms. Both artists' styles contain floating biomorphic forms that are connected by delicate line work; in the case of Mir©o's work, the forms float against an atmospheric background, in Calder's, the forms literally float in the air. Red, Blue & Black Cascade clearly demonstrates the all-encompassing universality of Calder's art. His unique ability was to create works of exquisitely balanced composition which retain their harmony when set into motion. While Red, Blue & Black Cascade conjures up the association of nature and distant constellations, the mobile is not fettered by any direct notion of representation. Instead, it interacts with its environment and its viewer, participating actively in the universe in its own right. A push or a gust of wind will set its carefully balanced elements in motion, introducing the magical element of chance and movement that make Calder's sculptures so fascinating. As Calder himself said, 'When everything goes right a mobile is a piece of poetry that dances with the joy of life and surprises' (A. Calder, Calder, London, 2004, p. 261). "I am not trying to make people happier by my work. But it happens that all those who have something of mine, painting, mobile or static statue, say that it makes them very happy." (Carmen Gimènez and Alexander S.C. Rower, eds., Calder: Gravity and Grace, New York: Phaidon Press, Inc., 2004, p. 54). A 360-degree view of Alexander Calder’s hanging mobile, Red, Blue, and Black Cascade, created in 1974, to be offered in the upcoming Post-War and Contemporary Morning Session in New York on 14 May 2014.